RAYTOWN, Mo. 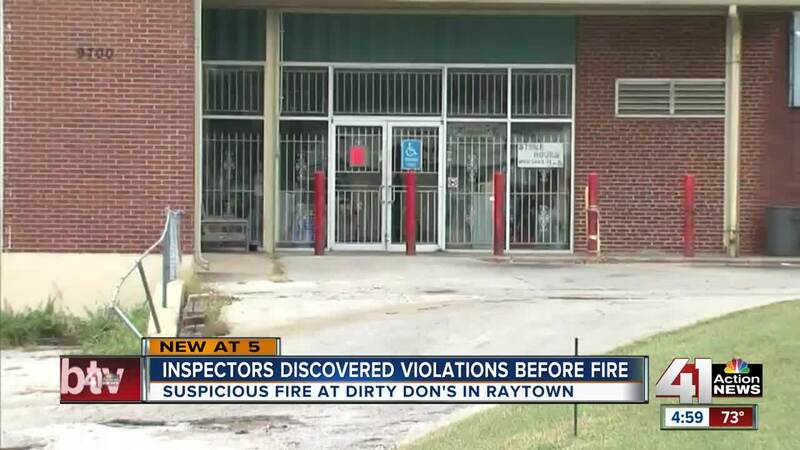 -- Fire officials and Bureau of Alcohol, Tobacco, Firearms and Explosives agents continued to investigate a “suspicious” weekend fire at a Raytown business on Monday as new details were uncovered on recent inspections at the site. The fire took place early Sunday morning at Dirty Don’s Bargain Center off East 56th Street in Raytown. Two of the four buildings at the site suffered damages estimated to be more than $100,000 combined. While the exact cause of the fire still remains under investigation, officials told 41 Action News that the circumstances surrounding the incident remained suspicious. On Monday, customers continued to stop by the business despite police tape blocking off the entrance to the store. The store, which sells surplus food and other items, was inspected by both health and fire officials last week. Last Tuesday, a Jackson County Environmental Health Division inspector found numerous violations at the business. Evidence of mice chewing through some food packaging in the storage building. Last Friday, fire officials also conducted an inspection at the site. Investigators noted that pallets of items were stacked high and dangerously crooked in the storage buildings. An investigator also told 41 Action News that inspectors found a sprinkler system shut off inside one of the storage buildings that burned two days later. On Monday, a fire official said it was still unknown whether the violations had any impact on the fire. News of the suspicious fire investigation brought some worry for neighbors and businesses nearby. The owner of Dirty Don’s did not respond to a request for comment from 41 Action News.